AGUIRRE Jean (ESO,ROO) Ses perform. 2016 ALFONSO Joseph JSSE) Ses perform. 2003 BALLESTER Barthélémy (JSSE) Ses perform. 2007 BELLIA Georges (Relizanaise) Ses perform. BLASCO François (MCO) Ses perform. 2003 CAUDAL Raymond (MCO, ROO)) Ses perform. 1982 CHAUDIERES Fernand (ROO) Ses perform. 2009 EGEA Emmanuel (MCO, ASPO) Ses perform. 2005 ESTRELLA René (JSSE) Ses perform. 2011 FAUCHE Emmanuel (MCO, CSM, ASPO) Ses perform. 2016 FRANCISI Pierre (ROO) Ses perform. 2001 GARCIA Jean (JSSE) Ses perform. 1993 GIMENEZ Antoine (CSM-ESO) Ses perform. 2015 GIMENEZ Paul (ESO-ROO) Ses perform. 1988 GOMIS Anacleto (CSM) Ses perform. 2003 GOMIS Vincent (COB) Ses perform. 2004 GONZALEZ Yvon (ASPO) Ses perform. 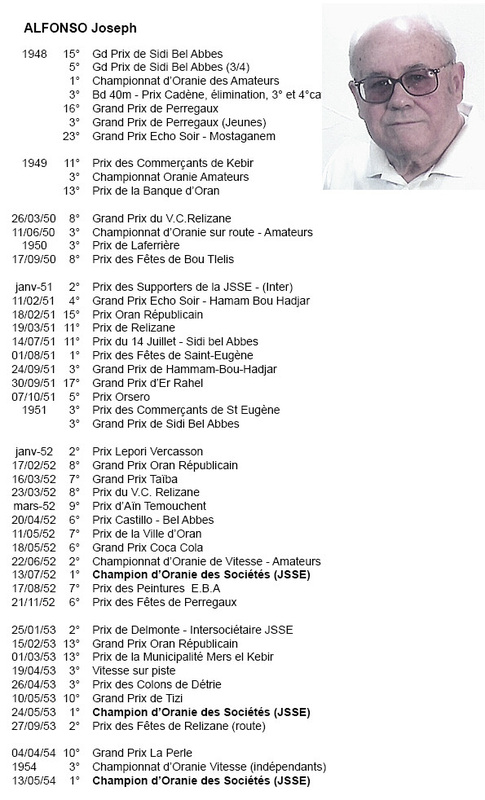 2000 GRANGIER Louis (JSSE, AVCO) Ses perform. 2013 HARO René (PCBA) Ses perform. 2004 HERNANDEZ Jean (ROO, VCT) Ses perform. 2013 LAVARELO Guy (ASPO, COB) Ses perform. 1997 LE BORGNE Simon (COB) Ses perform. 1962 LESTOURNEAU Georges (ROO) Ses perform. 1986 MARTI Léandre (CSM, ESO) Ses perform. MERCIER Maurice (CSM, VSBH) Ses perform. 2015 MOINE Pierre (ROO) Ses perform. 2016 MONTALVA Jules (PCBA) Ses perform. 2012 NAVARRO Jean-Claude (COB) Ses perform. 2000 NIETO Ernest (VSBH, CSM, JSSE) Ses perform. 2017 PEREZ Robert (JSSE) Ses perform. 2019 REMANGEON René Ses perform. 2005 RICHIER Henri (MCO, ROO, ASPO) Ses perform. 2019 ROCAMORA René Ses perform. 2013 RODRIGUEZ Albert (VSBH, ASPO) Ses perform. 2006 RUIZ Jean (MCO, JSSE) Ses perform. 1991 SANCHEZ Antoine (MCO, ROO) Ses perform. 2012 SERRANO Joseph (CSM-VCT-CRAC) Ses perform. 2015 TROUVE Edouard (CSM-ESO-ROO) Ses perform.